Perfect for families and small groups. Plenty of room on 6 acres of Lake Superior coastline. Amazing Grace is a beautiful 3 bedroom, 1 bathroom cabin located a stones throw from Lake Superior. Amazing Grace is about as close to Lake Superior as you can get. Enjoy amazing views from most rooms and from your private lake-facing deck. The cozy living room features log furniture. Cozy up to the wood stove on cold evenings. The kitchen is well-equipped for preparing meals during your stay. The first bedroom, located off of the kitchen, has a queen sized wood hand carved bed. The high ceilings and wooden details make this a cozy north woods retreat. Open the windows on warm summer nights and fall asleep to the sound of waves hitting the shoreline. The second bedroom features a queen bed. The second and third bedrooms and a bathroom are located down a hall from the living room. The twin over twin bunk beds are perfect for kids in the third bedroom. Need more sleeping space The futon provides yet another place to lay your head. The bathroom features a walk-in shower. Just steps from your own private cobblestone beach. Enjoy all of the unique aspects of this North Woods Cabin. You cannot beat these Lake Superior views. Lake Superior has a beauty even in freezing form. Enjoy the winter sunlight. Always saying something with the ice formations. Good Morning, sunshine. The quintessential vacation cabin on Lake Superior is only minutes from Grand Marais and the Gunflint Trail. Enjoy a cozy evening in the living room next to the woodstove while listening to waves just outside the windows. In the morning, carry your cup of coffee out to the deck just feet from the water. The 6-acre lot offers plenty of privacy on a quiet and picturesque street. This one-level, easy access cabin has two queen beds, a twin bunk bed, and two full-size futon couches so bring some family or friends along on your North Shore escape. Need even more space? Always Grace is a beautiful 3-bedroom property located right next door, making these two rentals the ideal location for a family reunion or friend's weekend away. The convenient location of Amazing Grace puts you just minutes away from many Lake Superior attractions and dining options. Less than 5 minutes away, in Grand Marais, you will find a wide variety of quaint small-town ma & pa shops and a variety of restaurants. Take a stroll along the harbor or out to Artist's Point to enjoy the beautiful lake-side scenery. Up for more of a challenge? There are several state parks and miles of hiking trails just a short drive away, including Judge C. Magney State Park, home to the famous Devil's Kettle. Whether it be winter or summer, there is plenty to do on the North Shore with Amazing Grace as your home base. *You will need a 4 wheel drive vehicle in the winter to access the parking area by the home. There is winter parking at the top of the road for 2 wheel drive vehicles. Totally enjoy Amazing Grace....that's my second time I've stayed there. I like it's privacy in relationship to neighbors, super close proximity to the lake, full access windows facing the lake, knotty pine accents, love the septic tank needle stitch piece hanging in the bathroom -- Amazing Grace is an awesme destination ! 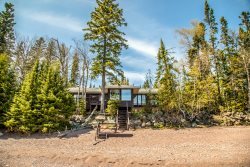 We loved the location of the home on Lake Superior and the private beach. The cabin was VERY clean and had everything I needed to cook our meals. My only complaint would be the lack of a bathtub, but that was minor. The home was very clean and we instantly felt like we were staying at a friends house. It was very inviting and had several books that we were interested in reading. There was a big selection of games for us to play at night as well. We could tell that this was a home filled with love and warmth. We enjoyed the Christian feel this appropriately named Amazing Grace rental home had. The outdoor waterfront was perfect with the fire ring as it gave us an opportunity to stargaze and stay warm! The location was perfect - right on the lakeshore, beautiful cabin as well. We especially liked the radiant heat flooring in the living room.